Misfit has turned up the glam at CES, by launching the Swarovski Shine – a pair of new fitness trackers which includes the world’s first solar powered wearable fitness tracking device. The striking looking pendant or bracelet is obviously aimed at women and comes with added fitness tracking smarts, with looks dominated by the giant Swarovski crystal. It's a piece of smart jewellery, which has nine supporting accessories meaning the new look Shine can be bought as part of a dizzying array of bundles. The project is an official partnership, with the design work done by Swarovski's in house team in France, rather than the crystals being bought in bulk and stuck on – like the Samsung Gear S strap we saw at IFA. The Swarovski Shine features all the same tracking technology as its forefather the Misfit Shine and cheaper cousin, the Misfit Flash. That means step and activity tracking, as well as sleep monitoring, with results delivered via the Misfit smartphone app. The Swarovski Shine comes in two versions, a clear version that uses a battery and boasts an impressive 8 month life, and purple variant, which comes with the solar tech inside. The purple Swarovski Shine is embedded with solar cells, and can charge from the sun’s rays and artificial light– meaning there’s no need for batteries or charging. It uses “energy crystal” technology to make the most of the small surface area, which enables the attractive Swarovski gemstone to refract light from all angles onto the solar cells, making it much more effective at harvesting energy. The solar functionality will only be available on the purple crystal at launch, partly thanks to the colour purple being better at dealing with light, and mostly because the coloured gem better hides the ugly solar panels on the watch’s surface. “We were looking for a global brand, that’s well known in the US and China, with a design language that was immediately recognisable, and a design language that was interesting. Shine, sparkle, it all made sense,” he said. “The problem is that normally a solar cell this size isn’t going to be that effective at harvesting energy as it can’t get enough sunlight. But here, the Swarovski crystal actually refocuses light back onto the cell. The design works in tandem with the technology,” Vu added. He went on to assure us that 10 to 15 minutes of light will power the Shine for several days, and that the bulbs in your home or office are plenty powerful enough to juice up the device. 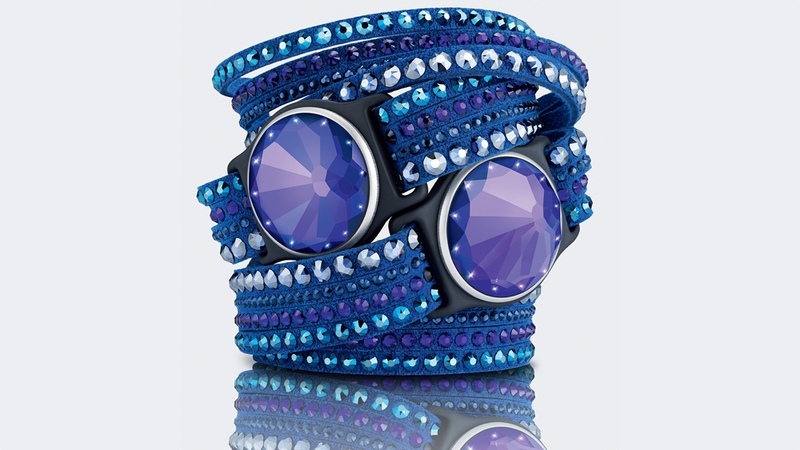 The Swarovski Shine is now available to pre-order in the US at the Misfit website, and will ship in March. It will be sold in bundles ranging from $169 and $249 before going on sale at Swarovski stores in US, Hong Kong, and China and on Swarovski.com in the Spring, with Europe to follow later.